Hawk Performance has developed the ideal rotor that optimizes brake performance and durability for short track racing. Our DTC rotors combine advanced design and metallurgy to create the perfect “match set” system when run with our DTC brake pads. 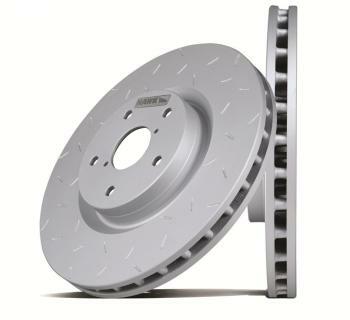 More stopping power and longer life are what you get when you install DTC rotors and pads! DTC rotors are cast from a proprietary formulation of premium alloys, including long grain carbon iron for maximum thermal stability and resistance to distortion. Additional elements include copper & molybdenum for hightemperature strength & thermal crack resistance. DTC directional rotors are engineered to provide efficient cooling, exceptional wear and reduced rotating mass for hard and intermediate braking asphalt & dirt track applications. Additionally, the combination of our unique interior vane and mounting lug design provides superior structural integrity. DTC front rotors feature our exclusive slot design that produces superior initial bite, release characteristics and wear debris removal. All DTC rotors incorporate a specific RMS finish that enhances the creation of a proper transfer film, especially when run with Hawk’s DTC brake pads. Each DTC rotor is meticulously checked for proper balance, thickness, flatness and run-out. All rotors are manufactured in ISO certified facilities located in the U.S.A.